High Life Below Stairs was originally published anonymously. The curious thing is, the author really wanted to make sure you knew he didn’t want you to know who he was. Got that? Much later it was learned the author was the Rev. James Townley. (wiki). A mutual friend connected him with David Garrick. 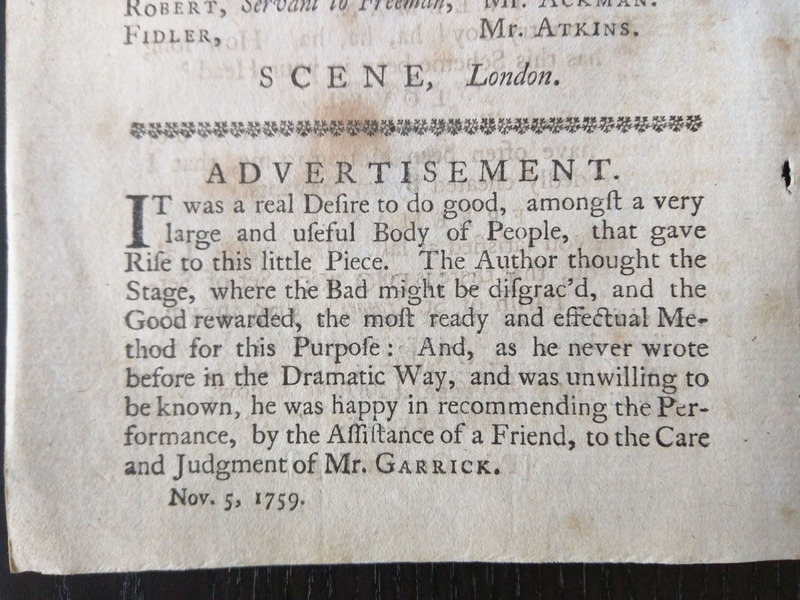 Remember, this piece is first staged and printed in 1759, a full 10 years before Garrick’s Jubilee for Shakespeare held in both Stratford and at the Drury Lane in London. Here’s the particulars for the play as published in the first edition. The play caused a bit of trouble among those in service, who took the play as an insult upon the profession. The author, Rev. 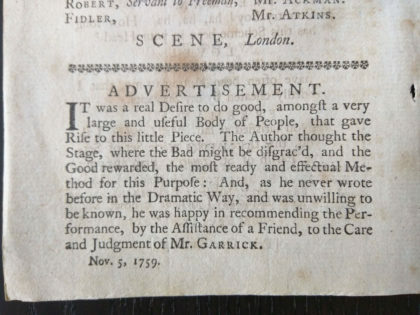 James Townley, followed up with a pamphlet in 1760 “An Apology for the Servants” where he explains they were not the intended targets of his satire. Townley claims that he, himself has been in service for many years. Townley was not simply anonymous for the Apology for the Servants. This time he chose a pseudonym. Oliver Grey. If you are student of Rambler’s investigations into the language of Shakespeare’s time, you’ve already recognized this name as an excellent example of Vere words. Oliver, Vere characters Monsier D’Olive (O devil!, he is tressell legged) and Oliver Owlet, patron of players in Histrio-Mastix. Rambler has noted Mercury’s cadeacues is made from olive wood, connecting Oliver to Rambler’s vast web of hermetic evidence (!!). Grey is vair, French for the heraldic gray/white fur of the Russian squirrel. Vair and Vere are homophones as pronounced in the 16th century. In choosing Oliver Grey as a pen name, Townley is signaling he knows the true author’s identity. The obvious question is; where did he get this information? As usual, the final lines of the pamphlet hold the important information. Rambler has shown the many allusions to playwrights as weavers, tailors, sempster’s etc. The list of precedents is long. The Spital-fields section of London was first settled by Hugenots. David Garrick was of Hugenot lineage. The last master Townley as “Grey” lists is the Hugenot playwright/actor David Garrick. Rev. Townley served as chaplain to Lord Mayor of London. I don’t know the exact dates, but his timeline implies the 1740s. The Lord Mayor’s office is held for only one year’s term. The Lord Mayor in 1742 was George Heathchote. Heathcote was educated at Middle Temple. He was the son of a Jamaican merchant. Lovel, the head of house in High Life Below Stairs is a Jamaican plantation owner. Heathcote served as an MP, and he was a Jacobite. Townley’s older brother had difficulty gaining his position in the college of heralds due to his own Jacobite connections. I believe George Heathcote is Townley’s “bencher of the Temple” and likely Townley’s source for his information on Shakespeare. David Garrick, the weaver in Spital-fields was the destination of this information.